I am just back from my trip to Poland after speaking at the Atheist conference in Warsaw. 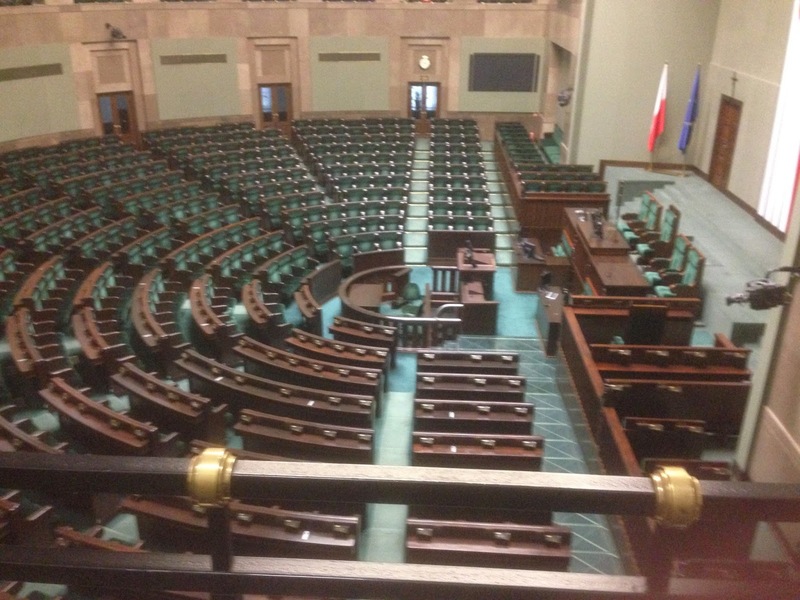 I am still having to pinch myself that we actually spoke in the Polish parliament building right in the middle of fiercely catholic Poland! It hadn’t been easy! 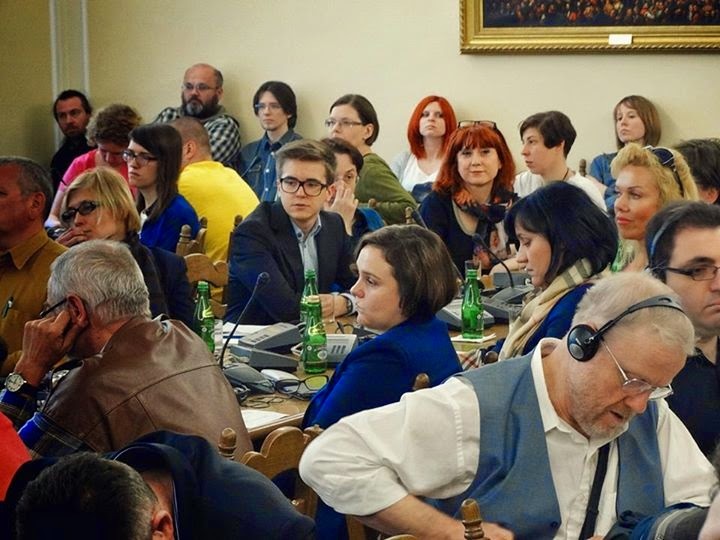 The organisers headed by the lovely Nina Sankari met with many obstacles but were wonderfully supported by a brave Member of Parliament Wanda Nowicka, who is the deputy speaker. 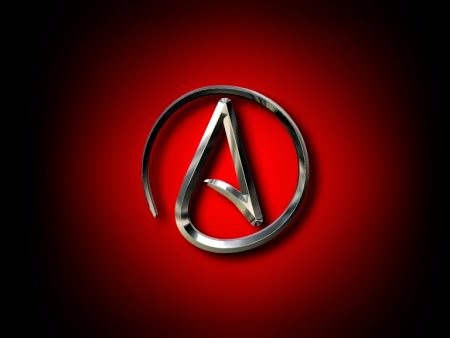 The sessions held in the parliament had to be re-named to the “Freedom of speech and Bio Ethics” conference, because of objections of the word ATHEIST by the catholic church! The conference, however, was truly brilliant, and the welcome I received was amazing. I had been asked to keep the presentation “personal” I think it would have been more than worrying if I had been openly critical of catholicism, so I had to restrict myself to a personal experience. But it was warmly received and very much welcomed. They are so aware of the rot within the church, and like the rest of the world there are so many victims of clergy in Poland who get very little justice. It is hard to describe the level of power the church has in Poland, and the blind obedience that is constantly on show. On the trams people cross themselves every time they pass a church,( which is about every three hundred yards.) There is a radio station and a TV station “Radio Maria” broadcasting prayers and services around the clock. There are pictures of John Paul11 everywhere, like a film star,almost deified, and many schools , roads, buildings, churches are named after him. In the main parliament building (like the house of commons) someone , apparently in the middle of the night, nailed up a crucifix above the platform, and having been put there it can now not be removed because it is considered “historic”. There were catholic anti- abortionists and anti birth control campaigners in the streets outside the parliament as we went in, shouting abuse at us. I heard some wonderful speakers all over the weekend highlighting many areas where religion of many different hues (although in Poland when anyone says “church” they mean catholicism) is interfering in human rights, women’s rights, GLBT rights, sabotaging research, all of the things you would expect from a narcissistic organisation. Two main speakers had been stopped from attending, one from the Charlie Hebdo staff for “political reasons” and one from Pakistan was kept so long going through red tape at the airport that he was made miss his plane! 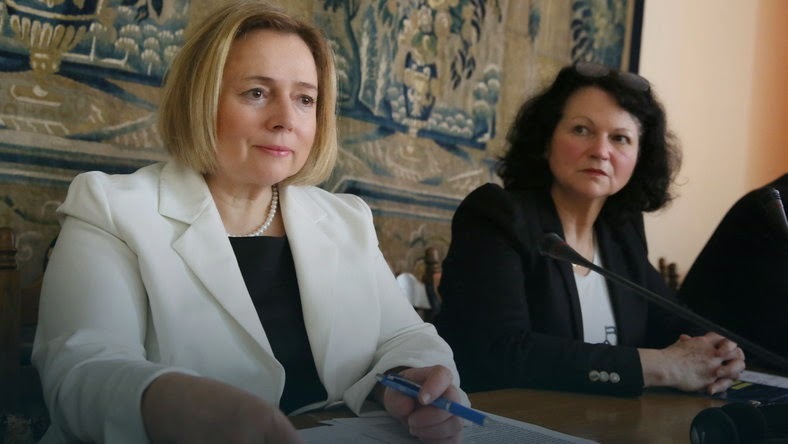 Despite that, speakers from France,The Lebanon, Germany, Belgium, Canada were among the contributors as well as Poland.One delightful lady told the story of being sacked after many years as a teacher, of 40 of her colleagues, previously friends, turning against her – her crime? to take down a crucifix in the staffroom of her school! In the session named “Bio ethics” Professors of genetics, anthropology, philosophy etc. 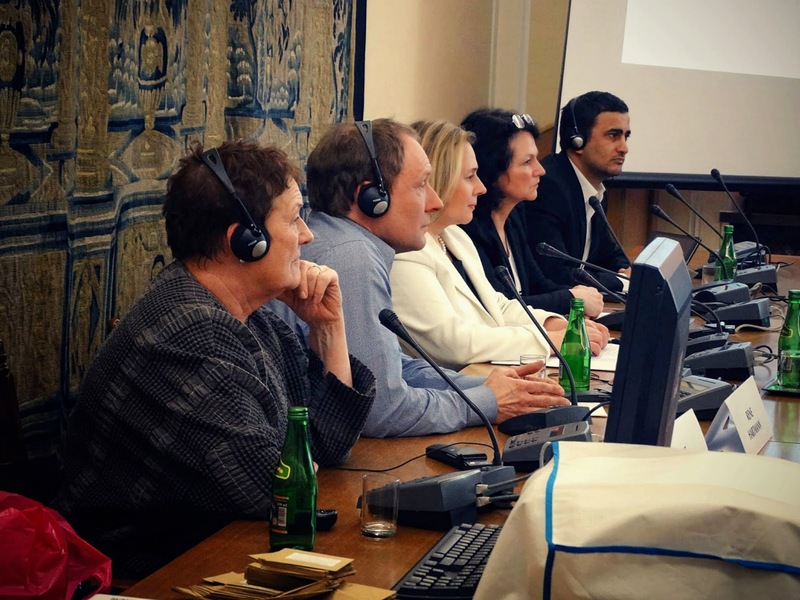 from various universities presented their experiences of religious interference in education and medical research. 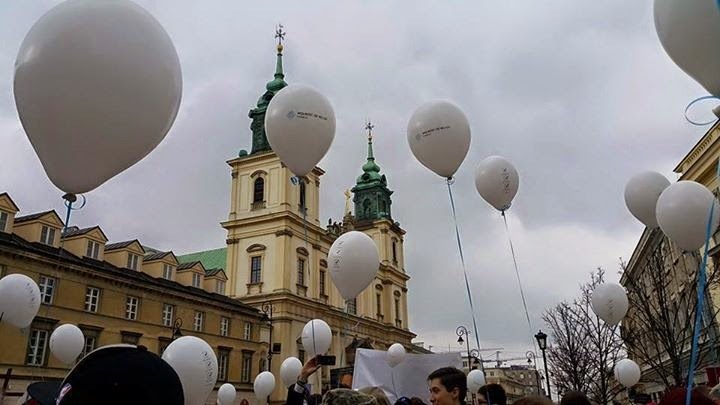 On the second day there is a “secular” march from the statue of Copernicus to the old town square where they re-enact the execution of a 16th century atheist who was tortured and killed for saying there was no god. Everyone dresses up and although it is a good natured humorous event, it is also a very clever and significant play. As we marched silently with our balloons and banners, we were attacked by groups of catholic louts, young people who had been organised to create havoc on the march. Singing and screaming abuse telling us we were all going to Hell, they were really quite alarming. There were young women who were part of the group, and I don’t think I have ever witnessed such hatred in anyone’s faces. To my surprise, however, the Police actually moved the loudest of them away! Two men carried a huge religious banner silently praying all of the time, as if they were in the presence of the devil! Because of the drip drip drip of intense brainwashing and indoctrination there is huge catholic paranoia, they seem quite incapable of understanding anyone that has a different point of view. Freedom of conscience and expression is still a long way off from being accepted here. Some of the marchers thought the attacks were funny, and I am sure that is the best way to deal with them, but as as someone who has already been abused by the catholic church I found myself feeling vulnerable and abused again. I came away realising how lucky we are in countries where free speech is not only tolerated but is celebrated, where although the catholic voice is venomous, it is at least “small” and I felt a close affinity to the wonderful atheists in Poland who will always have a big place in my heart!